If you’ve reached middle age and find you’re feeling back pain, you could be suffering from one of the most common conditions we see at Total Chiropractic Care and Wellness. It’s called spinal stenosis and it can be a painful affliction that is common with people over 50 but can affect all types of people. According to the website Spine Health, spinal stenosis is an abnormal narrowing of the bone channel occupied by the spinal nerves or the spinal cord. It can be an inherited condition, but more often than not, it’s a degenerative condition. Aging can contribute to that process, which is why we see so many middle aged cases. 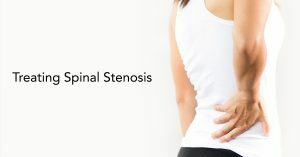 Total Chiropractic Care and Wellness wants you to know about spinal stenosis and how we treat this painful condition so you can get the help you might need. According to the National Institutes of Health, symptoms of spinal stenosis can develop slowly. Initially there may not be any neck or back pain. But more often than not, people experience numbness, weakness, cramping and pain in the arms or legs. The narrowing of the spinal cord could strike a nerve root, and this can cause pain to shoot up and down your legs. One sign that you might have spinal stenosis is if sitting or flexing your lower back lessens your pain. This is because you are opening up your spinal column and enlarging the area between the vertebrae and the back of the spine. It’s for that reason that exercise is considered a good way to ease the symptoms of spinal stenosis. According to WebMD, you should do it in moderation, for example, taking a 30 minute walk. Applying heat can loosen up your back while a cold compress can help heal inflammation. Weight loss can also ease the pain. All of these are non-surgical alternatives. Another way to avoid surgery related to spinal stenosis is chiropractic care. At total Chiropractic Care and Wellness, one of the most common treatments we use for our patients is spinal decompression. Patients who receive spinal decompression treatment are strapped onto our decompression table. While the table may bear a resemblance to an old fashioned traction table, don’t be fooled. The decompression table is computerized. It gives our doctor, Todd Goldman, the ability to precisely focus in on areas that need treatment. The table moves and produces a distraction force on targeted areas of the spine, particularly where compressed discs press onto nerves. Distraction force creates negative pressure, which operates like a vacuum, allowing herniated or protruding discs to be pulled back into place. The treatment also allows blood and nutrients to circulate more freely through injured discs. Each treatment lasts 30 to 45 minutes. At Total Chiropractic Care and Wellness, we understand that each patient is different and we’ll design an individual treatment plan for you. If you have spinal decompression or if your coming to see us about any other pain management issue, we’ll examine you and we’ll help you put together a plan to achieve wellness. It may include chiropractic manipulation or spinal decompression. We’ll also talk to you about diet, exercise and lifestyle. If you’re concerned about back and neck pain, we can help. Contact us today.